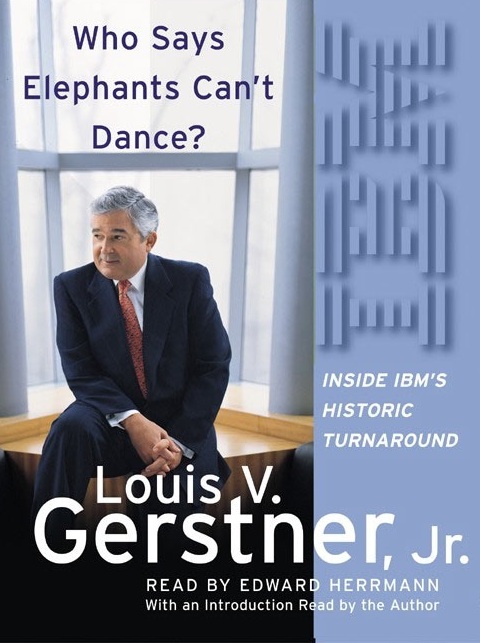 Louis Gerstner was the recent Chief Executive Officer of International Business Machines at the time he wrote this story of his ten years at the company. Technology platforms tend toward monopoly, and the monopoly that build IBM was the System/360. IBM sold a high-margin, integrated computing solution for companies that limited the uncertainty large computer buys experienced, at the cost of a higher price tag. Because IT is cost center for most companies, overpaying for computer equipment (relative to market rates) but with the need for a less skilled IT workforce (relative to companies that bought less expensive equipment) made IBM an attractive force. Unix, an operating system family for ‘computer computers’ (which is now featured on many smartphones), was soon joined by the down-market competitor of PCs running Microsoft operating systems and Intel computer chips. The cost advantages of Unix and Microsoft against IBM soon became substantial enough for corporations to save money buy building their own IT departments to handle Unix and PC systems, and IBM’s System/360 fell behind..
Gerstner understood the market IBM was in was technology services. In the 1960s, as today, most companies do not want to be in the Information Technology business. Wheter you talk about “software as a service,” or “cloud computer,” or whatever, the basic concept is the same: moderately-priced reliable service is better than internally-sourced attention-demanding IT. Sadly, by the early 1990s, the System/360 family not was just one of many computer architectures, along with Unix and Windows, and so IBM was no longer a one-stop shop. This is the situation that Gerstner inherited. There were two naturally roads for IBM in the 1990s to return to being a sole-provider. One was to double-down on the System/360 family, and fight off Unix and Microsoft. Another was to abandon any hope of reestablishing a monopoly in computer equipment, and flee up the value chain by being a consulting & integration computer. Gerstner, who several times in the book decries the focus on technology platforms as irrational, chose the second. I’ve been thinking about monopolies a lot recently (which has inspired excellent posts on other blogs, as well), and have written about IBM in the past, as well. Who Says Elephants Can’t Dance is the fascinating story of a former monopoly reborn as a competitive market player.Â While like other books (including On China by Henry Kissinger, and Deng Xiaoping and the Transformation of China by Ezra Vogel) you need to read between the lines on occasion, the book was well worth it. I listened to Who Says Elephants Can’t Dance, unabridged, on my Kindle. Lyons, D. (2007). Snowed by SCO. Forbes.com. September 19, 2007. Available online: http://www.forbes.com/2007/09/19/software-linux-lawsuits-tech-oped-cx_dl_0919lyons_print.html (from Slashdot). In the print edition of Forbes there’s a great (albeit sometimes painful) tradition of doing “follow-through” articles where a reporter either takes a victory lap for making a good call or falls on his sword for making a bad one. Online publications don’t typically ask for follow-throughs. But I need to write one. For four years, I’ve been covering a lawsuit for Forbes.com, and my early predictions on this case have turned out to be so profoundly wrong that I am writing this mea culpa. What can I say? I grew up Roman Catholic. The habit stays with you. The case is SCO Group v. IBM. In March 2003, SCO sued IBM claiming that IBM took code from Unix–for which SCO claimed to own copyrights–and put that code into Linux, which is distributed free. Last month a judge ruled that SCO does not, in fact, own the Unix copyrights. That blows SCO’s case against IBM out of the water. SCO, of Lindon, Utah, is seeking bankruptcy protection. But I still thought it would be foolish to predict how this lawsuit (or any lawsuit) would play out. I even wrote an article called “Revenge of the Nerds,” which poked fun at the pack of amateur sleuths who were following the case on a Web site called Groklaw and who claimed to know for sure that SCO was going to lose. Turns out those amateur sleuths were right. Now some of them are writing to me asking how I’d like my crow cooked, and where I’d like it delivered. For some reason, a lot of technology journalism has devoled into hit-piece journalism, like the recent factually untrue CNET review of Lotus Symphony. Forbes, seeing blood in the water, did the same, attacking both a respected global services provider (IBM) and bloggers following the case (GrowkLaw), helping the corporate scheisters of SCO spread fear, uncertainy, and doubt. But IBM was right, the blogs were right, and SCO (and the mainstream media in Forbes) were wrong. Now Forbes admits it. A boost for open source software (OpenOffice.org), a boost for open standards (OpenDocument), free trade in services, and retro (I was confused how the new Lotus Symphony would relate to Lotus SmartSuite, until learning that there had not been a new SmartSuite since 1999! Elsewhere online: CNET has a factually incorrect hit-piece (among other errors, Google Docs supports OpenDocument just fine). And Dana Blankehorn examines IBM’s wider open source strategy. Over the past few days, I had the great pleasure to savor a 1989 speech by Bill Gates to the Computer Science Club of the University of Waterloo. My previous exposure to Bill Gates’ thought had been rather disappointing — Business @ The Speed of Thought has to be one of the emptiest collections of cliches ever written — so I tuned in mainly for the nostalgia. Little did I know that I was in for 93 minutes of brilliance. Bill Gates speech in 1989 reveals two things: he is an expert at technology and an expert at strategy, both theoretical and applied. Except for the parts of his speech which deals with the specific environment of the late 1980s, most of Gates’ technological statements are timeless. Listening him to talk about his vision for programming I kept having to tell myself that .Net wouldn’t be released for another 14 years. Likewise, listening him to how he structures teams at Microsoft, and how he forms goals and sets release schedules, I kept being reminded of Chet Richards’ Certain to Win: The Strategy of John Boyd, Applied to Business. The grand view of Gates’ ability is emphasized through his repitition of a near-disasterous decision. At the time, Microsoft and IBM were collaborating on a new operating system called (with typical IBM finesse) OS/2 (short of Operating System / 2). The relationship would collapse the very next year. IBM and Microsoft have very different operating philosophies, and Microsoft assisting in building and promoting IBM’s “successor” to Windows was in retrospect unimaginably dangerous. It was as if Queen Elizabeth I had supplied timber and workers to build the Spanish Armada. Of course, like in that war, it didn’t matter. But Microsoft had a unity of purpose, iterative design, and flexibility. IBM had none of these. Within half a decade, the war was essentially over. IBM released the last commercial version of OS/2 in 1996. The overwhelming power & success of Microsoft Windows, by contrast, needs no elaboration. For years IBM’s strength rested on vendor-lock in and vendor-compatibility. A company that wished to buy electronic computer equipment had one choice, Big Blue, which offered complete systems that were entirely under the control of IBM. IBM keyboards communicated in IBM EBCDIC to IBM terminals, connected through IBM wires to IBM mainframes, IBM harddrives, IBM tape backups, and IBM power supplies. The complete solution set took the world by storm, offering One Ruleset (Buy IBM) which entailed numerous sub-products. The system worked. In the same way, the One Ruleset of the Koran swept aside the old Roman world, tearing up the Orthodox and Arian peoples it subjugated, rolling back much of the Christian 4GW revolution. Islam did this almost as an afterthought, as it also spread into formerly Zoroastrian, Hindu, Buddhist, and Animist countries. No one ever got fired for buying Big Blue, and no one ever got beheaded for embracing Islam. A famous example of Microsoft’s embrace and extend philosophy is the Redmond corporation’s response to SUN’s Java Programming Language. Java was one of a line of programming languages, beginning with C, whose goal was to make it easy to write a program one time and run it on many different computers. Java went even farther than its predecessors, however, in that the computer would translate the written Java code into a java file that could be read the same way under all programming languages. The Islamic / IBM solution would have been to fight this, and wipe Java off of the map. This is exactly what Islam did when the Sharia legal code completely displaced ancient Arab laws, completely displaced ancient Roman law, and completely displace dancient Persian laws, in the lands it was implemented. Sharia covered the transition from boyhood to manhood, the transiion from bachelorhood to single life, who may be drafted and who may be head-taxed. The One True Way had an answer for everything. International Business Machines similarly displaced everything that came before with the Operating System/360. MFT, MVT, BOS/360, TOS/360, and DOS/360 were all specific prescriptions of the OS/320 system, mere details of the IBM way. The conscious goal of IBM was to turn a corporate customer “all blue,” where custom-built IBM hardware ran everything. Micrososoft’s response to Java was smarter. Instead of condemending Java, calling it a stupid language, and ignoring it, Microsoft opted to embrace and extend. Microsoft devised Visual J++, an implementation for Java that actually provided the best interface for developing Java applications yet. Microsoft perfected the nature of Java from a good idea that was hard to work with to a good idea that was easy to work with. Microsoft also extended J++ by adding features that were unique to Microsoft’s Windows operating system. These extensions fixed Java’s biggest weakness, lack of speed, by allowing J++ programs to operate the same as programs written in other popular languages (C, C++, etc.) and even faster than Microsoft’s own Visual Basic language. When SUN complained that Microsoft embrace of Java, when Microsoft’s love and generosity to a potentially dangerous rival, was unfair, Microsoft refused to look away. Microsoft continues development on Java-like languages. Today, if you want to use a Microsoft Java-like language that taps in to all the power of the Microsoft .Net programming environment, you can, for free: Visual J# 2005 Express. Even more lovlingly, Microsoft’ primary programming language, C#, is famous for being frighteningly similar to java. And just as the Jesusist-Paulists adviesd one to repair evil with kindness, Microsoft responded to SUN’s increasing hostility with more love: giving C# away for free. If “Embrace & Extend” sound like a way of penetrating a market and separating the customers from the old market-leader, it is. Embrace & Extend are the first two pages of the PISRR stages of victory. As embrace & extend leads to a form of subversive victory, the paranoid accusation that Microsoft secretly wished to “embrace, extend, and exterminate” simply makes no sense. Microsoft wishes to embrace, extend, and own. One can view this as a variation of the original OODA/PISRR loop of victory. However, under the Embrace & Extend system, whether implemented by Microsoft or by the Jeusist-Paulists, the circle is broken. Once the system is embraced and extended into pre-existing systems, and rival organizing principles are abolished, there is nothing more to do. The war would have been won. The Jesusist-Paulists of the Catholic Church behaved the same way. They embraced the old cultures of Europe, refusing to look away when revulsion would have been easier than love. And they extended the old orders, giving new life to the status quo ante sancata romana ecclesia. For instance, in southern France where the old Senatorial families still held sway, the family names of the early bishops were the same as the family names of the last Senators. In Ireland, where an indigenous Church had grown after the abduction of the slave boy Patricius, Romanization was handled primarily through institutional fusion. And in the Viking North, the Church refused to look away from the bloody tribes — instead embracing them. It would have been easier to have, and ignore. But the Christians loved, and embraced. And, of course extended. Even through the crippling Islamic blockade of western Europe, the practice of slavery faded away. The locus of Jesusism-Paulism, the Bishopric fo Rome, continued intellectual engagement with the Byzantine Empire to the east, continued doctrinal promulgation throughout Europe, and in general did all that a conquering power could do. Yet even as the Church loved and embraced and extended the cultures of Western Europe to serve Jesusism-Paulism, the counterrevolutions had begun. The old Maoism of Greek civilization was not dead, and for a thousand years it rolled back the success of the 4GWarriors. What followed next may have been Christianity, but it was not Jesusism-Paulism. But those are stories for other times.